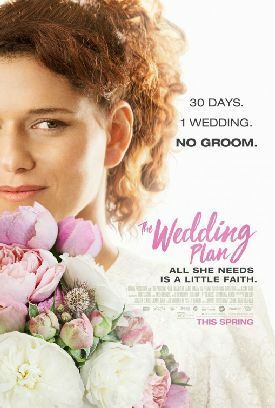 Others have pointed to the fairy-tale quality of Rama Burshtein’s Hebrew-language movie (with subtitles) The Wedding Plan, but the comparison with folk art can bear a little elaboration, I think. For there is something of the fairy tale, not only in the movie’s high-concept subject matter — which is a young woman’s seemingly insane confidence that her Prince Charming, "the love of my life," will suddenly appear to take the place of the fiancé who has jilted her in time for their planned wedding, a month hence — but also in the manner of its telling. It begins, for example, with the visit of the heroine, Michal (Noa Koler) to a Wise Woman, a stock figure of fairy tales, who smears her face with fish blood and asks her the same question several times: what does she want? At first Michal answers: "To be married" but to this and each subsequent answer, the wise woman repeats: "Don’t lie" — until Michal gets down to the presumptively true answer: that she wants to be normal. She wants to be respectable. She doesn’t want to be alone. She wants to be able to hold her head up among her married friends. This we can believe, in spite of (or perhaps because of) its shocking political incorrectness. Even Michal’s job, which consists of driving a battered old van containing a mobile petting zoo to children’s birthday parties, sounds like something out of a folk tale. Or an Ann Tyler novel. Beautiful princesses down on their luck often find solace in the natural world, and are restored to their rightful place in the world by their sympathy with even such unlikely members of the animal creation as Avi, Michal’s pet snake. Of course, Avi also reminds us of the creation story in Genesis, the ambiguities of which are perhaps more savored in Jewish than in Christian tradition. It is not altogether clear how Michal comes away from her visit to the Wise Woman with her bizarre resolution to persist with the marriage plan in spite of the absence of a groom. "I have the hall," she tells her; "I have the dress; the apartment is almost ready. It’s a small task for God to find me a man by the eighth night of Hanukkah. . . The only thing I lack is courage" — by which she must mean the courage to believe that her God, the God of Orthodox Judaism, deals in this kind of fairy-tale magic. The motif of the repeated question is itself repeated, including in the flashback scene in which she herself repeatedly interrogates her fiancé until he admits that he doesn’t love her anymore and becomes her ex-fiancé. Thereafter, she is provided by an unseen matchmaker at the other end of her mobile phone with a series of would-be suitors who must also be questioned — one in sign language, through an interpreter — and who question her. The deaf one, noting that she has been given his name before but chose not to meet him, asks why she wants to meet now. With an air of self-discovery she answers, at length: "Despair." That appears to be something of a disqualification in the deaf man’s eyes. And yet the movie is about despair’s opposite, which is faith — in particular, Michal’s faith that God will provide the husband she desperately wants to believe in before the appointed wedding day. In addition to the other difficulties in the way of this almost magical (and therefore also fairy-tale) eventuality, Michal must therefore interrogate herself and her own motives in reacting as she does to each of the men she meets. Besides the deaf one there is a wilfully blind one who refuses to look at her, or to any woman but the woman who will be his wife, on the ground that if he sees only that one woman she will be the most beautiful woman in the world to him. To him she says he’s the only one she has met who is crazier than she is. But she also meets a charismatic Israeli pop star called Yoss (Oz Zehavi) who, if your money is on the full fairy-tale ending, would be the one to bet on. I forbear to mention if you would be wise to do so. At one point she blurts out a proposal of marriage to this guy, however, and one of the groupies standing around at the time says: "Get in line, girl." She first meets Yoss after flying to Ukraine to visit the tomb of the holy man Rabbi Nachman, a site of Hasidic pilgrimage, in search of another source of divine aid. It’s one of many references to her religious faith, which naturally, over the course of the movie, becomes all mixed up with her faith in the advent of the unknown bridegroom. Another rabbi warns her against "counting on miracles" — something, he says, that even a saint wouldn’t dare to do. But as Michal counts on her miracle, so do others. Her sister, for one, who is married to a man who has been and is still being unfaithful to her. But the sister refuses to accept this and loudly insists, to him and to the other woman as to the whole world, that he still loves her. And, lo, he comes back to her, which inspires her to utter what we might like to consider as the key line of the movie: "Truth is what works for you; everything else isn’t real." It’s an audacious doctrine, but one very much in keeping with the spirit of our age in which everybody, it sometimes seems, claims a proprietary stake in reality. My reality, though unreal to everyone else, easily becomes reality tout court. At some level we always know that this cannot be true, and yet at the same time we never entirely stop believing that it might be true for us. As Michal says to Yoss: "To find the love of my life in the twelve days before Hanukkah is no more a miracle than finding him at all." This belief even extends to Michal’s saying to a wheel-chair bound friend, or perhaps another sister, who is unable to move or speak: "Anything can happen; Everything is possible." Something that would ordinarily be considered as insensitive as that might easily have upset the delicate balance between comedy and seriousness that prevails throughout the film, but I don’t think it does, quite. Michal’s faith in the miracle is simply meant to be seen as becoming infectious to all the others around her, so that perhaps it will extend even to this poor woman, who is otherwise a kind of memento mori and a reminder that prayers are not always answered as we would wish them to be. I realize that this may make the movie sound ridiculous, as doubtless it would be if it had been made in Hollywood — as, of course, it never could have been. But that it is only ridiculous in the way that fairy tales are is largely owing to Ms Koler and especially her face, so often seen in close-up that we get to know it as a lover might, and so expressive of the hope and anguish at her heart that we can’t help believing ourselves that she is destined to love and to be loved as she believes she will be. Maybe that’s the secret of all fairy tales: that they somehow have the power to make us believe that what we know is not true in general really can be true for those with the luck to find the magic words or the magic talisman that makes reality our own.